Paying Ready Attention: Waders and wet meadows. I woke to the sound of gulls fighting over a fish. Possibly both herring. I lay still and let the sounds of the day come to me. Swallows chittered softly somewhere and house sparrows chattered to each other from the bushes in the garden below. There was a sharp rhythmic pinging sound as a rope slapped against a flagpole that proudly flew the flag of Orkney. Bright sun leaked around the edges of the blinds, even though it was only just gone 5 o’clock. Here, the tilt of the Earth brings early mornings and late evenings; there is no midnight sun, but the days of summer are long. Compared to the tram bustle and traffic drone of Melbourne, such sounds are a lullaby and I quickly fall back into sleep. Strangely, even the morning sounds of a place I have never visited before sound more familiar than the soundscape I have awoken to for more than 20 years. That may explain why my return to sleep was so rapid, so predictable. A couple of hours later I wake for real. The gulls have gone, but the slap, slap, slap of the rope against the flagpole remains. A breeze of varying strength will be my companion for the next few days; an Orkney weather constant I am told. I suspect that I can also hear the whispered conversations of the local people, saying that the sunny weather will not last, cannot last. But it does. After breakfast we go in search of birds. The mainland of Orkney does not have the abundance of wildlife of some places, but what it does have is a way of taking you back in time, to when plenty was a given, and rarity was not the new normal. It’s a place where you expect, rather than just hope, to see things. It’s a place where fields hold birds and flowers as well as grass and cows. It’s a place where the edges are soft and uncertain, where diversity thrives in the absence of the ruler’s edge and the laser’s guide. Field corners and fence posts hold surprises; owls fly unexpected over the road and flocks of eider, hidden by the edge of the shore, take flight on wings that whistle. We hear the creaking call of a corncrake, a bird that winters in Africa and breeds in the long summer days of Scotland. It’s a bird ill-suited to modernity, a bird that needs long grass and untidy corners in which to thrive. Empathy may be impossible, the mind of the bird an unknown, but I think I know how it feels. 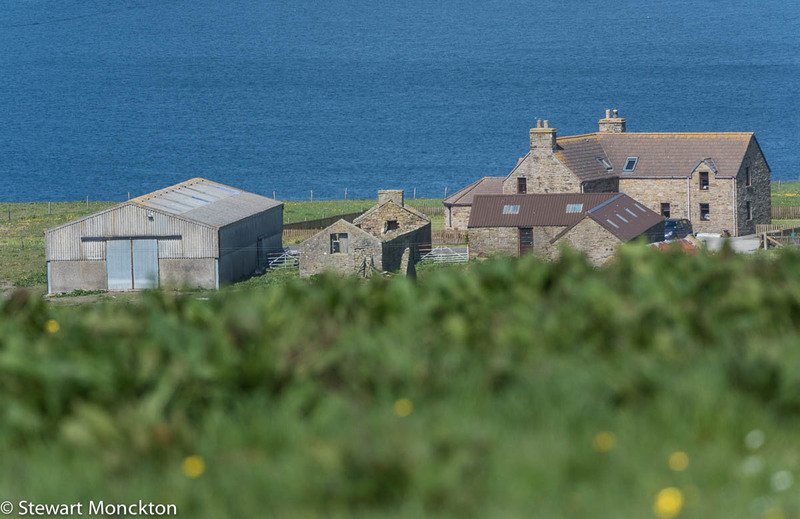 It is undoubtedly an illusion, but heading to the southern islands of Orkney feels as if you are going down hill. 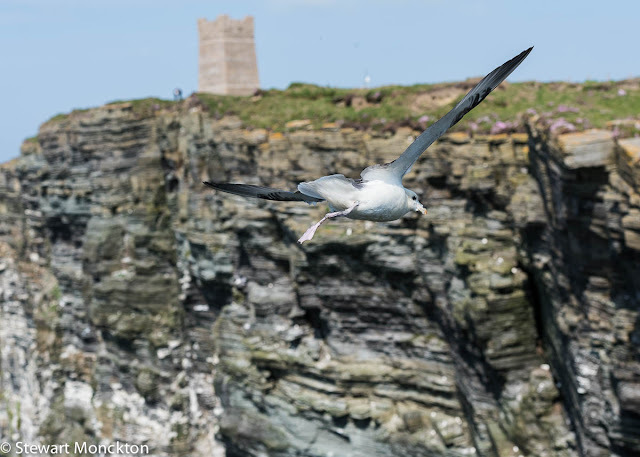 To the north, there are tall cliffs that are home to Fulmar and Guillemot, and a few Puffin; the people’s favourite. Rock Doves, the wild first fathers of the urban pigeon, live in fear of Peregrine and you are never far from the sound of wave on stone. Atop of Marwick Head a monument to Kitchener overlooks the cold waters where he died, his boat hit by a mine. It’s both a strange and an appropriate place to commemorate World War One’s poster boy. The long shadow of war reaches even to these cliffs, which seem to be haunted by more than just gulls. The road south from the hotel takes us over a Churchill Barrier, another intrusion from the world of war into these cold waters. 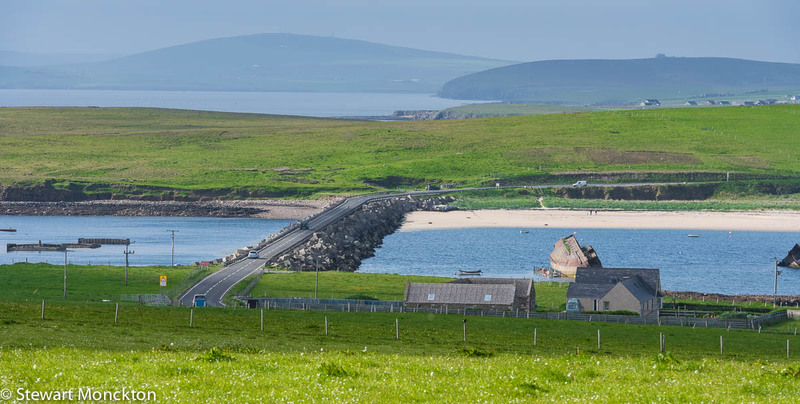 The great natural harbour of Scarpa Flow is surrounded by Orcadian Islands, and the water the flowed between these islands could have brought submarines to attack the great fleet sitting at anchor. So the ways were blocked, first with sunken ships and then, more lastingly, with barriers of stone and concrete. The ships are fading with time, tumbling down to rust and broken beams. But the barriers are still there. Where they once brought protection they now bring changes. Currents that flowed for thousands of years stopped in a geological heartbeat and sand that was once washed away formed new beaches on old rock. Built by Italian prisoners of war, the barriers produced a landscape that looks more Mediterranean than Scottish, although my experience of both is weak. In the strand line Ringed Plovers search for food in short rushed journeys, pausing to watch us watching it, pausing between tiny morsels of food. Their stop start motion seems never ending, a life full of searching and uncertainty. A dog bursts from the sand dunes, all flailing ears and disjointed limbs. This is too much for the plovers, which take flight with sharp, ringing calls. The wind, ever present, pushes the birds inland, over the dunes, out of sight. The owner of the dog appears though a gap in the dunes and the Plovers never come back. The dog runs in the waves and bites the water in excitement. The owner takes a different approach and sits at the dune edge and watches. The sea brings more sand to the beach and the wind takes some away. Our footprints fill behind us, while the sand to our front is smooth and unbroken. The wind keeps blowing. All hints of morning cloud have been shifted away by the wind, and the sky is deep blue and vast. Sea smells and sounds fill the air. From the far end of the beach the laughter and happy screams of cold-water swimmers add the only human sound. Overhead, Little Terns screech protests at the dog and his owner, both of whom seem oblivious to the presence of the birds. The terns are as tiny as their name suggests, but their voices are much louder. They are flashy flyers with rolls and steep, wing bending turns and dives. Plastic replicas, convincingly coloured, but unconvincingly still, sit on empty nests, presumably to encourage more authentic breeding. The real terns are too fast and too tiny for pictures – and I suspect that the letter of the law prevents too close an approach. These are bird for wonder and watching; there is little need for anything else. On the hills beyond the edge of the island, a little further south, the view opens to show the line of the Barrier back towards the Mainland island. The block ship sticks from the water, broken teeth, jagged with rust. It’s only later that I find out that these sunken ships failed in their last task – to protect the great ships of war that sat vulnerable at anchor in Scarpa Flow. 834 men paid with their lives for that failure when the Royal Oak was sunk by a submarine in the autumn of 1939. In the bright sun, with the wind pushing land waves of tall grass towards us, it is hard to believe that so much death and horror could come to a place so far from the centre of things. 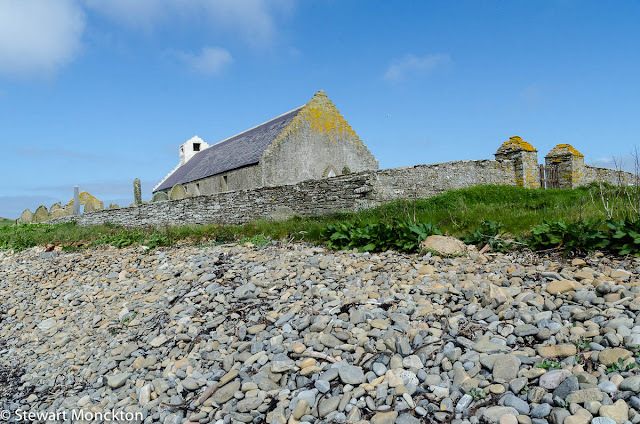 Orkney has been many things to many people, but a vision of the islands as charnel house and slaughter field is hard to conjure. Such things should be remembered by those who would lead us back to the Little Europe of the past that killed its young and its best with little thought or consequence. The wind keeps blowing, but it seems people do not hear the words it carries. Down by the coast a grey farmhouse sits, four square and firm in the lea of a small slope. Its windows are small and the porch over the door large. This is testament to the real weather of these islands, and the possibility that bright sun and blue skies are far from the norm. Out to sea a boat passes with high kicked spray. Fishing and farming. 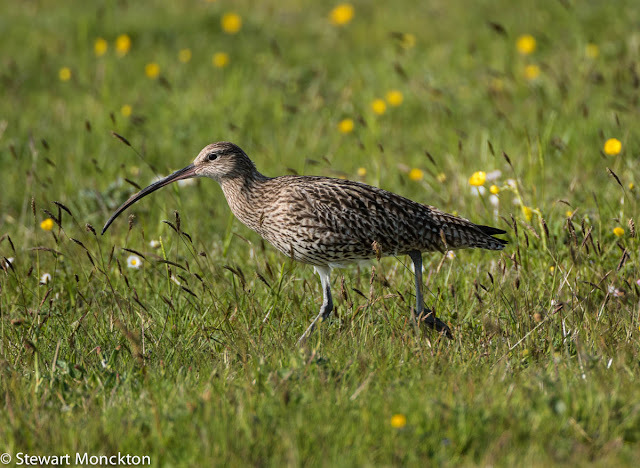 In the field across the road a Curlew sounds its bubbling call. A hint of the old ways in a new age. Land and sea. Sky and sound. The past in the present, with history in the rear view mirror as we drive away. Heading south, looking for waders and wet meadows. A maze of roads covers the southern end of South Ronaldsay. Roads meet and depart from each other for reasons which may have made sense once, but now that reason seems to have been lost. Navigation seems both pointless and futile; all roads lead nowhere and end up, eventually, back at the same place. Ring roads and farm bypasses with white lines replaced by a median strip of grasses and weeds. In the folds of the land yellow flowers bloom and sway. Every field seems flanked by roads and pathways, ghosts from a time when each patch of land had a different name and a well-known purpose. Calving fields, lambing fields, fields that offered shelter when the wind was from the east and fields fresh with the promise of early spring feed. People have tilled and toiled here for so long that each and every inch of the land is known. Only old places hold such a network of knowing. There is the strange feeling that the roads are looking after you, guiding you back to a place that you know – it’s a small place, a place where you may not know where you are, but in which you never feel lost. 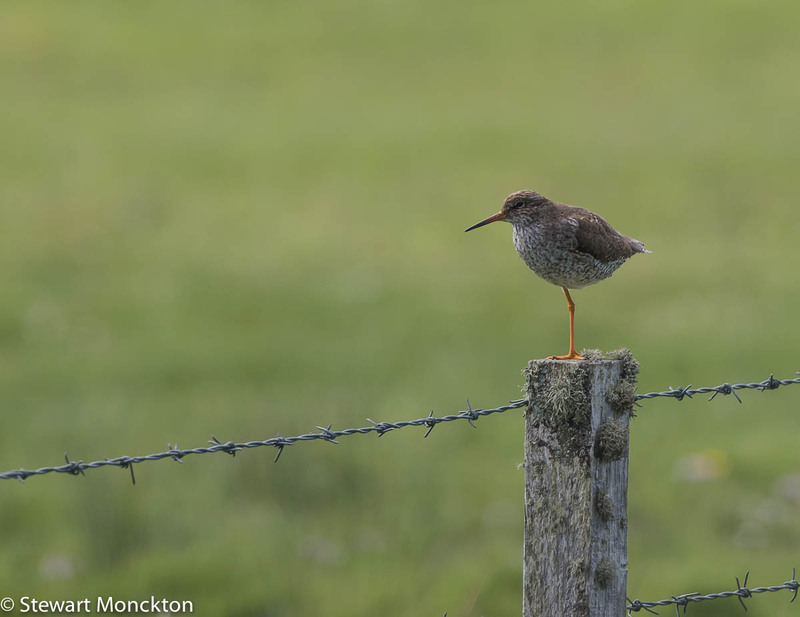 On a fence post a Redshank tells the world that this is his patch and that intruders will be dealt with. Down in the mud and the long grass there must be a nest, or huddled young ones, as dependent on the adults as the adults are on these wet pastures. To be complete both need the other. It’s the way things are supposed to be. A Curlew with a field running chick displays to lead us away, predators that we must be. A few Lapwings feed in the mud. I grew up calling this bird a peewit, a name that seems to have slipped from usage. The name and the places in which they breed, both pushed back into memory, recalled only by the old and those of us who do not always accept that modernity is the same as progress. Down by the shore we sit in the shelter of a stone bank, thrown by winter storms and high tides. Behind the bank a small church, built of rough cut stone, and haunted by the calls of Swallows, stands without a village or congregation. The building is old, deconsecrated and for sale. No running water, except that which falls from the sky. No electricity. Just four low walls and a sturdy roof. As the UK prepares for isolation and America embraces lunacy, it seems the perfect place to be. A place that, for a while at least, seems free from the constraints of idiocy and the constriction of possibility. A family of Eider swims by the shore and a seal bobs in the water. The air is clear and the sky open and fresh. I wish my family could see this place. A few hours later I drop my bag on to the floor of my hotel room in Glasgow. My coat smells of salt air and sunshine. As the day fades I hope the waders of Orkney survive the short summer night and wonder what it would be like to return in the winter, with its daylight famine and stormy darkness. Barrow and beach. Storm and stones. Waders and wet meadows. Sometimes the impact of place does not depend on the duration of the visit. I suspect some places will linger longer than others. By the time I am fully gone, I know I want to go back. Hi. Great photos. I think it's great that sunk or foundered ships can be reached. Even nicer would be to dive the wreck. Beautifully written with an encompassing sense of place, Stewart. I enjoyed experiencing the sights and sounds of this beautiful secluded place with you. I like your photos too. Wonderful post and gorgeous photography ~ love the bird on the post ~ thanks! Beautiful travel log. I cherish travel mornings above all others. The sun is gentle, the birds are awake and everything is fresh. I saw a new bird in Florida this month. A Limpkin. New to me. Happy travels! 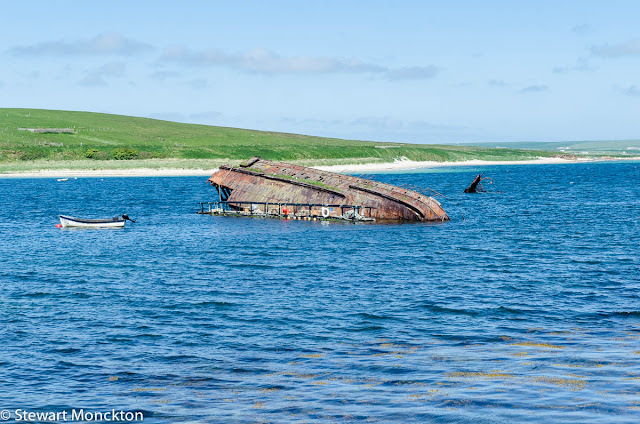 Wonderful views of Orkney a place on my wish list! Wishing you a very Merry Christmas and a Happy Healthy New Year. A delightfully eloquent post, Stewart. I've never been to the Orkneys, but I now feel that I must try to fit in a visit. Thanks for taking me along for the trip- very interesting to see the sunken boat in the water. Very well written. I could hear the sounds around you. I want to go back to your blog, and visit often! Cheers from Perth, ON!